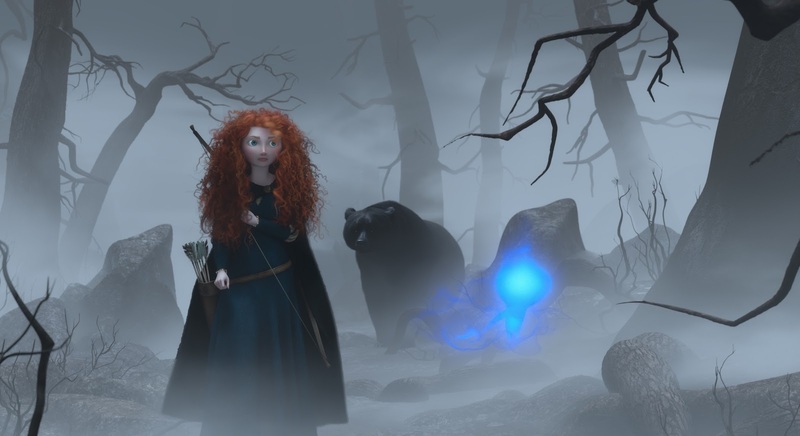 Brave is the new fantasy adventure from Pixar Animation Studios and it features the studio's first female protagonist. Though the Hayao Miyazaki influence is apparent - Miyazaki's heroines are complex and wonderfully written characters, usually taking a coming-of-age journey through a fantasy realm - Merida (voiced by Kelly McDonald) is an excellent female character to centre this entertaining tale around. Written by Mark Andrews, Brenda Chapman, Steve Purcell and Irene Mecchi, and directed by Andrews and Chapman, Brave is set in the 10th Century Scottish highlands. The story follows Merida, a skilled archer with a keen sense of adventure and little interest in learning the ways of the court of her father, King Fergus (Billy Connolly) and mother, Queen Elinor (Emma Thompson). She defies an age-old tradition, which places both her family and the kingdom in danger, and it is up to her to find the courage to re-write her fate. In the film's opening sequence King Fergus presents his daughter with a bow and arrow for her birthday, much to the displeasure of her mother who believes no princess should possess a weapon (nor place it on the dinner table). We also witness a giant bear named Mor'du attack the family, with the ensuing battle resulting in King Fergus losing his leg. Though he enjoys telling the story to anyone who will listen, he vows to someday hunt down and kill Mor' du. Years later, Elinor has given birth to triplets, and is committed to teaching Merida everything she knows in preparation for her to some day take the throne in her place. These lessons are strict and direct, but Merida is disinterested and has no desire to have the life mapped out for her by her mother. The other three lords of the Kingdom; Macintosh, MacGuffin and Dingwall, arrive at the castle presenting their first-born sons to compete for Merida's hand in marriage. 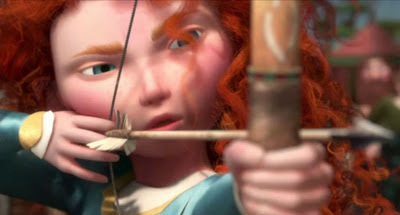 Merida proposes an archery challenge to decide the suitor, but embarrasses each of them with her superior skills and declares she doesn't want to marry. Merida and her mother have an argument; a family tapestry is ruined, Merida's bow and arrow is burned and she flees into the forest. Merida finds herself in the cottage of an elderly witch. Declaring she knows a spell capable of transforming Elinor's opinion on the arranged marriage, and ultimately Merida's fate, Merida takes her advice. The ensuing complications - including the permanence of the spell unless undone by the second sunrise - test her will and courage, but ultimately strengthen her strained relationship with her mother. There are two strong-willed female characters, with the mother-daughter relationship well realised and providing the backbone for the film. What is surprising is that Merida's journey is not so much a physical one, but a personal journey about self-acceptance and learning how to better communicate. Merida's respect for her mother, and her mother for her, increases as Merida realises her mother has her best interests at heart and her mother accepts her daughter's destiny for a different path. By rejecting her mother's guidance, and facing the repercussions of her decision with the bravery she displays, she becomes a more capable Queen than she ever would have otherwise. Brave is beautifully animated, with great pleasure to be found in the details. The make-up of the world is breathtaking; the wonders of the forest, the creature animation (and it continues to amaze me how personified Pixar animators can make animals) and the details that have gone into every set - the witch's woodwork cottage for example - is extraordinary. Merida, voiced to perfection by Kelly McDonald and with her kind blue eyes and giant red locks, is unforgettable. She is fiercely independent and though she loves her mother, grows frustrated knowing she has no desire to be the woman envisioned by her. But she is also a typical girl and teenager. She is facing a crossroads in her life and doesn't feel ready to make the decision that would secure the path of the rest of her life. When her family, and the kingdom, are endangered because of her ill-fated decision, it is up to Merida to find the courage to redeem herself and save her mother from a horrific fate. There are some important lessons here; the power of independence, the importance if communication between a mother and daughter, and following your dreams. Merida also proves that our destiny is not written for us, we have the power to write our own and secure our own fate. Pretty valuable lessons for a young audience. Brave is a delightful return to form for the Pixar team after a disappointing and unneeded return to the world of Cars. Telling a simple but pleasant story, which is enchanting with its blend of reality and fantasy and thrilling with its handsome visuals and grand score, Brave offers up consistent amusement - in particular through the three little rascals - and is sure to engage audiences of all ages. Having said that, this is probably the most child-centric Pixar film in some time, which is not a bad thing at all. Pixar aren't necessarily returning to their best, but Brave is not trying to match the awe-inspiring visuals of Wall-E or the narrative complexity of Ratatouille, but it admirably succeeds in what it is trying to do. With oustanding animation, which is to be expected these days, an excellent voice cast, and the perfect blend of comedy and drama, it is well worth seeing. It also has several scenes capable of bringing a viewer to tears, which further secures my recommendation. Great review! I'm really loooking forward to this one and with my love for all things Celtic and redheads it is safe to say Merida will become one of my favorite animated characters. Thank you! I really hope you enjoy it. I loved Merida.